The Moab Jeep Seat was designed as adirect bolt-in to CJ and YJ Jeepsbut will work in any other vehicle with Corbeau custom brackets. For those ofyou whoown Jeeps and drive them off-road, you know how bad those stock seats can be. We took the stock Jeep Seat, added harness slots, made the bolsters more aggressive, and with that came the Moab Jeep Seat. MUST be ordered in pairs (Quantity = 2) of seats. For single seat sales, please call for availability. 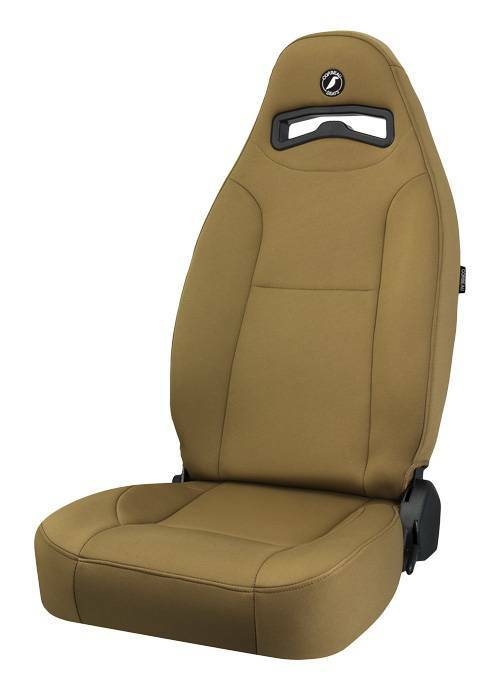 The Moab is available in matching stock Jeep black, tan, spice, and charcoal fabrics. We have a matching rear seat (Safari) that is also a direct bolt-in to CJ and YJ Jeeps. As a rule of thumb, the Moab will fit up to a 40-inch waist. The Moab Jeep Seat is available in Vinyl, Vinyl/Cloth Combo, and Neoprene materials.